Yesterday was beautiful, with gorgeous clear skies during the first half of the day and lovely mild temperatures. It was the first such day we’ve had this year. I took the dogs out for a walk around the property, my coat tied about my waist and my sleeves rolled up my wrists. It was that nice out. If I didn’t have things I needed to take care of back at the house, I could’ve spent the afternoon sitting out in the sun, soaking it in. The first warm, sunny day usually brings out the insects, too. There wasn’t too much happening out in the fields yet – a few spiders, some flies – but I had a pretty good feeling that I might get a moth or two to the lights. I wasn’t disappointed. When Dan went out to check, early in the evening, there was already one there. By the time I’d located my moth jars and stepped out myself, another had joined it. Officially, the first one to arrive is the guy up top: a Morrison’s Sallow, Eupsilia morrisoni. So, he gets recorded as the first moth of the year! Interestingly, it was the same species as I got as my first-of-season two years ago, in 2009. The one that came in to join him was different: Grote’s Pinion, Lithophane grotei, another late-fall/early-spring species that overwinters as an adult. It’s possibly the most common species of pinion I get here. When I came down to check the light again a bit later, more moths had arrived! Four more, in fact, came in before I went to bed. 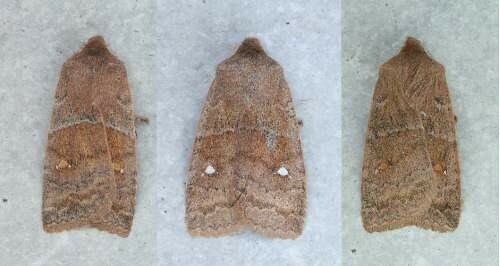 All four of these latter moths were Straight-toothed Sallows, Eupsilia vinulenta, which, like the previous species, overwinter as adults and come out at the first sign of warm weather. The Straight-toothed has two colour morphs: one with a white spot, and the other with an orange spot. I got two of each. I didn’t bother jarring the last white one, though, so only took photos of three of them. Considering I’d been crossing my fingers to get even one macro species, I was pretty stoked with this haul! 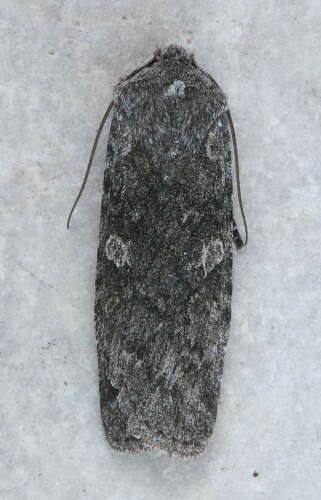 Well overdue, in my mind – the last two years have seen the first moth of the season on March 6th and 8th respectively. The winter cold was very persistent this year. I feel I can officially recognize the start of spring now! Love your blog. Happy “moth”er’s day to you! Yesterday it was really warm, so I put out my moth light in the evening. It was disappointing to get only one Gelechid. 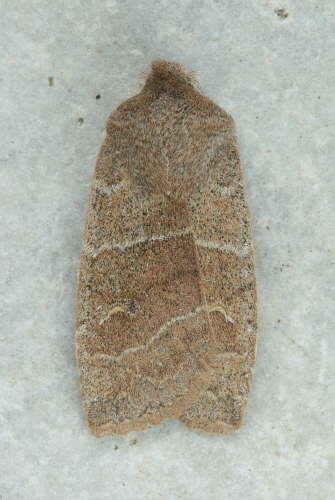 I thought there might at least be a sallow or another macromoth. Took me a minute to figure out that you were using a sticky post to get the “Marvelous in Nature” banner at the top of the blog page. Clever hack! It’s been a cold spring so far, John. By this time last year I’d already tallied more than a dozen species of moth. Indeed, Barbara – pleased that you like it! Thanks, Dave. Took a bit of puzzling to figure out – and didn’t realize it’d show up on the blog feed till after.